One of the points I often make when speaking at conferences/workshops is that most online reviews are positive. I say that because some small business owners are hesitant to get involved in review management and don’t welcome the idea of having customers talk about their businesses online, warts and all. But there’ve been a few data points over the years that show how most online reviews are positive. And TripAdvisor just added one more piece of evidence that supports the same premise. In fact, the majority of reviews on the site are positive. Three-quarters of all TripAdvisor reviews are rated “very good” or “excellent”, and the average rating on TripAdvisor is just over four out of a possible five. It’s also important to note that – according to this traveler survey – the number one reason travelers cite for writing a hotel review is to “share a good experience with other travelers”. Those stats are similar to what Yelp shares on its website about ratings/reviews distribution. 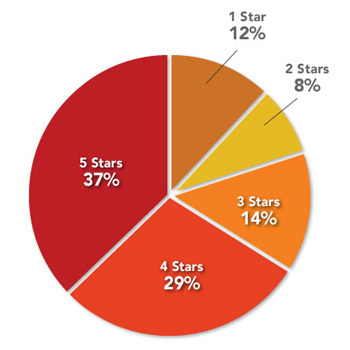 As of Q1 2012, Yelp says that 80 percent of its reviews are three-star or better. Most word of mouth is positive. Across all Bazaarvoice US clients, 80% of product ratings are 4 or 5 stars out of 5. Across all Bazaarvoice UK clients, 88% of product ratings are 4 or 5 stars out of 5. I think it’s natural for some small business owners (and big business owners, too, for that matter) to be hesitant about online reviews. A lousy review or a 1-star rating hurts, even if it can be good for business. But this is now three solid data points — coming from sources with millions of reviews — that show how most online reviews are very positive. If I’m reading reviews on a site I actually want to see some negatives. There’s no way to make everyone happy. If you aren’t getting some unhappy customers, you aren’t doing much business. When I see all positives, I become suspicious. Also, when you have a product or service focused on specific needs, you aren’t going to be pleasing people outside of those needs. Imagine reading a negative review of dress shoes that says “They hurt when I run in them.” Duh. Yet you do read those kinds of reviews- and to me that just enhances the impression that the product is good for the intended use if nothing else. Google and Yelp are always good sites to check. There will always be spam and staged postings, but the numbers show as a whole they work. I believe that the stat isn’t helpful if we provide low quality products/services. Rather than depends on stats, why not we improve our products/services quality? If we provide low quality products/services, the stat is meaningless. I agree with Keith. I also appreciate some reality amongst any reviews. No one product, or brand can be so awesome so as to not have any problems. Further to that, it’s good to see online whether or not they have brandvocates, people that will either defend their brand, or help getting the troubled soul some guidance as to how to get some help. Whether said brandvocate is in some way remunerated doesn’t matter to me. It just shows the company is taking the online community seriously.